I’m still not sure how comfortable the boat will be to paddle. I need to add a seat and some thigh padding before I can be sure, but I still think the deck may be too high at the cockpit. I may have to lower the shear near the middle of the boat, which will have consequences with regards to storage and camping in the cockpit. I’ve also been thinking about how to reduce the build time. I may change the build process. By doing most of the fabrication ahead of time and shipping the boat as an un-assembled kit I should be able to get the assembly time to a day or two. I’m also thinking about building the boat in sections that bolt together in even less time. Why not go with a skin on frame boat like the folbot, you ask? Too easy, and I want something more substantial than fabric under me when I get to alligator country. By the way, the photo above was taken from the Thermalito Diversion Pool below Oroville Dam. 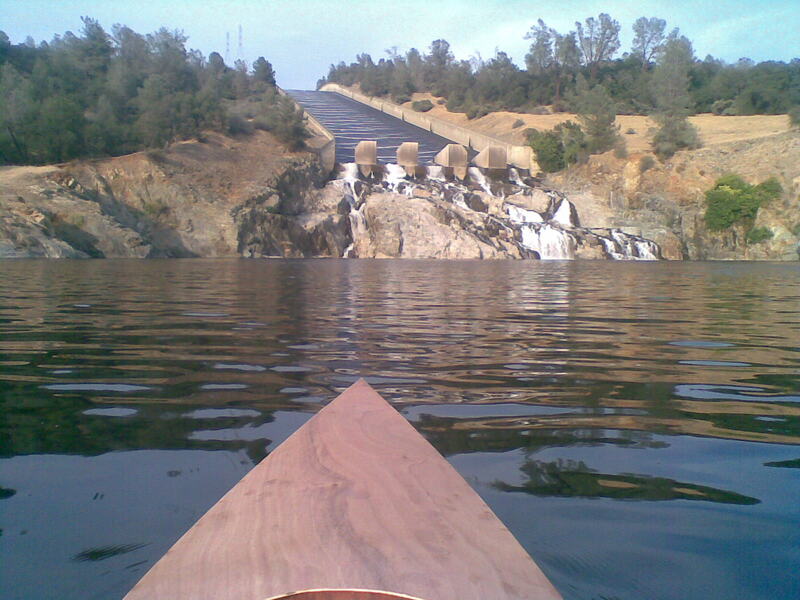 I grew up less than 20 miles from Oroville and never knew the diversion pool existed until about a week ago when I did a Google search for free kayak launch sites at Lake Oroville. I paddled from the lower end of the diversion pool up to the base of Oroville Dam and back on a Saturday afternoon and I was the only one on the water. It is a beautiful place to paddle and I highly recommend it if you happen to be in the area. It’s in the City of Oroville, but in a secluded gorge that is full of wildlife. I saw a bald eagle, foxes, loons, all kinds of wildlife.